"Mr. Popper's Penguins" director Mark Waters and producer John Davis dish on making the family-friendly flick. In theaters June 17! 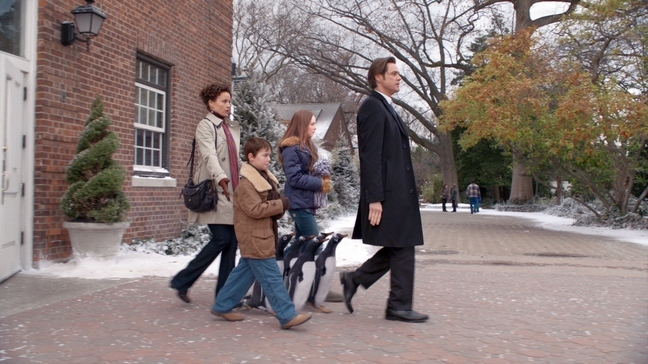 The summer movie season’s first live-action family comedy event stars Jim Carrey, whose chilly relationship with his family heats up after he inherits six adorable, lovable and mischievous penguins. Mr. Popper’s Penguins is based on the award winning classic children’s book. A great way to spend your Father's Day weekend – take your pop to see Mr. Popper! Check out the trailer here! As part of the press junket that Momtastic was invited to be a part of in L.A. last week, we were able to interview the movie's cast, as well as director Mark Waters ("Mean Girls", "Ghosts of Girlfriends Past", "Freaky Friday") and producer John Davis ( "I, Robot", "Behind Enemy Lines"). They chatted with us about why they chose Jim, how their own families affect their work, and what it was like working with "untrainable" Gentoo penguins. How did you know Jim Carrey was perfect for Mr. Popper? I knew the meeting was going to go well at that point. There's something about Jim. The other thing that excited Jim about this movie was the fact that we were going to work with live penguins. And I kind of had made this decision early on that we could do the whole thing with CGI, but it would be a little bit contrived and would be kind of only as good as our imagination. If we did work with live penguins half the time, which is what we ended up doing, then everything would be held to the standard of it has to be as kind of crazy and anarchic and funny as actual penguins are. When I said, "Okay. We're going to be on set. We're going to freeze the set down to 40 degrees and we're going to play with the scenes with penguins," I think that thrilled him because he knew it was going to be a lot more playful. Was there ever a point when you thought, "Oh, my gosh. Why did I do this? I should have just done all CGI." John Davis: It was great, though, having real penguins because, first of all, we got to hire a penguin expert and we got to know more about penguins. And we auditioned all kinds of penguins, because there is like 28 different kinds. So we had to find the right penguins. And we found the right penguins and we built an entire penguin habitat next to the stage in Brooklyn. And then, we had pools for them and lounging areas and all that stuff. And we got to go in every day. I got to go in every day and play with the penguins which was amazing. How did you choose which kind of penguin to use? Mark Waters: It was interesting because when we were researching penguins, I went to the San Diego Zoo and they took me back and I got to walk into the penguin habitat on the ice. And when you stand there, and as soon as we walked in, the emperor penguins, who are really kind of scary and big, they're like four feet tall, wanted nothing to do with me. And then, these little Adelie penguins, they're kind of the ones that you more think of as like traditional looking penguins. They were little crazed creatures who would just scatter to the hills as soon as they saw me as if I was going to eat them and wanted nothing to do with me. And then, there were this group of penguins who were kind of medium size, all kind of walked up and were all hanging around me just like looking up and kind of getting close to me, and very curious. And I asked, "What penguins are these?" they said, "These are Gentoo penguins." And I was thought "Okay, these are good penguins. They're a good size. They're friendly. They're curious." And then, I talked to John and John said, "It just so happens there's only eight penguins in all of North America that we can get our hands on." I asked, "Oh, gosh. What kind are they?" "Gentoo." I thought that we lucked out there. They got to be quite bonded with everybody by the end of the shoot. John Davis: Penguins have a mystical kind of connection with people. It's hard to explain, but everybody loves penguins, being around penguins. A lot of actors really wanted to do this movie, and a lot of them felt because they have this special relationship with penguins. And one kind of very famous movie star showed up at my office one day bearing gifts, statues of penguins, and said, "I really have to do this movie because I sleep with penguins in South Africa on the beach for months at a time starting up at the sky." And I thought, "Wow, I guess people really like penguins." Where are the penguins now? Mark Waters: The reason we got these penguins is that we highjacked them legally, but when they were being transferred from the Biodome in Montreal to Hong Kong. And before they made that trip, we basically said, "Hey, we're going to build a habitat next to our stage. Can we just borrow them for eight months or so and have them in New York City?" And so, now they've landed in Hong Kong again at the Ocean Park Institute there. And they're living happily there again. But, they were very happy with us. They came for two months before shooting just to kind of get trained. And no one had ever actually tried to train live penguins before. Larry Madrid, the animal trainer, is this genius, really, and has worked with John several times. And he said, "I can do some things with these penguins." And so, I'm actually very curious to see how they're going to adapt to being back in a zoo now that they're movie stars. When you're making a family movie what's the process for deciding what content may be a little too much, which jokes might be a little too risqué? Mark Waters: My kids are actually the target audience for the movie. They're five and nine. I would bring them to see the rough cut of the movie. And there were some things that got cut out of the movie because my daughter was said, "That's just scary." Or, "You know, I don't want to see that." And I thought, if it's too scary for them, I'm not going to subject other kids to it either. And other things they thought, "That's hilarious. I wish there was more of that." And I was thinking, "Huh, I cut a scene that had more of that," and it came back in the movie. Because we're both family men, it's as if, well, what would you say in the car with your own kids, you know? And that just becomes a barometer of this is what's appropriate for the movie. John Davis: My wife, by the way, was always a ratings Nazi, right, with the kids and all that stuff. So, for years she would research the movies before we'd go and see them. She would know the reviews or whatever every piece of language that was in the movie, and there were all these movies we could never see, right? So, it's like it kind of got drummed into me. What are some challenges of starting with a book instead of starting with an original script? John Davis: People know the book and they've known it for generations and generations and generations. So, you can't disappoint them, but you sometimes have to bring it into the modern age in order for it to be appealing to a new young audience. Mark Waters: Yes. I think the benefits of coming from a book are just the fact that they’re kind of immediately recognizable, “And hence it intrigues me." Having people have the interest of going, "Well, I read the book and I want to see what they did differently in the movie," you know? That creates an interest, too, even if it is that we were not being crazy loyal like the Harry Potter books or anything. Did you consider doing this movie in 3D? Mark Waters: No. Partially because of the fact that we knew that we were going to be doing a lot with live penguins, and 3D cameras are really bulky and kind of a pain to work with. And I hate up-converted, post-converted 3D movies. When a movie is planned as 3D and like Avatar or a good animated movie, it looks amazing. And you know, "Yes, they plotted it out. They shot with 3D cameras." When they just kind of decide to do it afterward, it always looks silly. And I wanted Jim and the penguins to have kind of freedom to move. And that's how my philosophy of comedy is. You really have to create an environment where all the actors feel like they can do anything and I'm going to be able to capture it. And something about 3D just felt like it would operate against that. John Davis: I've been through three distinct periods of 3D in Hollywood in my career. And each time it's come big and people have gotten tired of it. And I think they're getting tired of it right now. Stay tuned for our interview with Jim Carrey! Follow Mr. Popper's Penguins on Twitter and Facebook!